Hello guys, thought I'd write a guide on the Hybrid Life/ES trickster since I couldn't see any other recent guide on Hybrid trickster with the 3.6 expansion/patch. I will add more videos as time goes on, however now I am only running T16 Desert Spring, so I have uncompleted Guardians, so I don't want to run them atm. I am a slow mapper by default, if you play faster this will go alot faster, but I'm just generally slow, doesn't matter which build :D.
There are alot of trickster guides out there that use EB/Mom etc, but I like the version I'm playing more, feels more tanky to me. 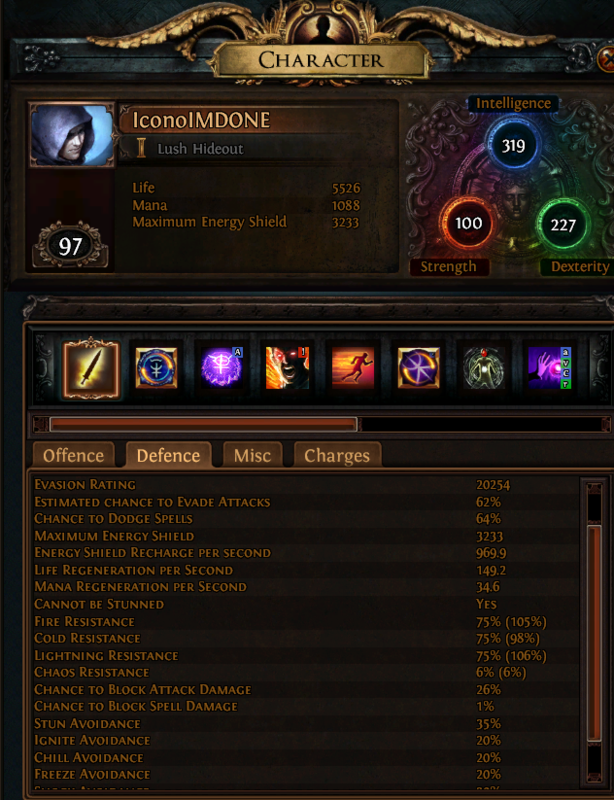 I have played HC every single league since I started playing in Breach and I've played every league so far, so this build is 100% tailored to HC, but adjustments can of course be made to accomodate SC players (giving more damage etc). I've played alot of different builds, but this is the first time I've played ED+Contagion and I'm in love. Right now I'm only running T16's and I breeze through them fast, killing everything, running every mod, killing all bosses. It feels so strange to play an evasion build and feeling immortal, I've played several bow/wand guys (see my profile for like 3 tornadoshot builds and 1 wander). I have gone under my ES (Lost all es+some life) twice, getting hit by some abyss mob and a beyond boss, other than that I've never gone below the ES value. This build utilises the updated Trickster Ascendancy nodes, mostly Ghost Dance and Escape Artist to get insane levels of defences, mostly ES Recovery/Evasion/Dodge and stun immunity. Unbuffed I have 20k evasion(62% evasion), together with Ghost Shroud this means that every time I get hit, I recover around 1000 ES if I haven't killed anything recently. Together with the Ascendancy node Patient Reaper that becomes even more. Together with The Perfect Form (https://pathofexile.gamepedia.com/The_Perfect_Form) and Atziri's Step (https://pathofexile.gamepedia.com/Atziri%27s_Step) I have 64% Spell dodge 100% of the time. (Can have 66 if you get perfect rolled Atziri's step) This is all completely unbuffed, no flasks active, no vaal grace, no normal grace. With my 290 ES "The Vertex", that gives me 1450 Evasion rating from the ES on my helm. This gives me a total of 2240 evasion rating solely from my helm. With all my % increases on the passive tree, this gives me OVER 10k evasion rating, just this helm. With my 1341 evasion rating chest, I gain 223 flat ES. Together with %increases to ES on my tree, it gives me around 700 flat es. The main thing I am doing with this build is MAPPING, not bosskilling (although I do kill all map bosses), so the skill tree is done to map more effectively, not bosskill. 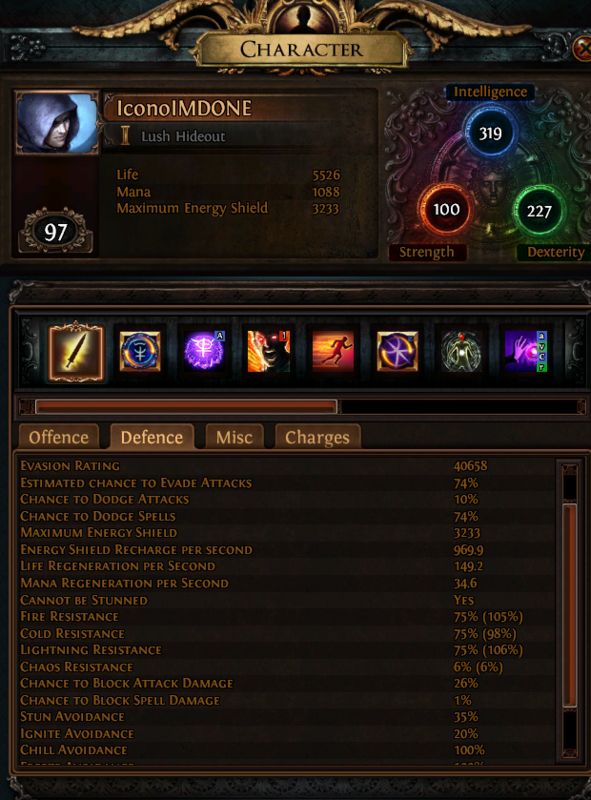 That being said, I have killed shaper guardians and Red Elder this league with this character. With the build I have, I go OOM on shaper guardians, so I can't use Blight on a 100% uptime. What I do is ED+Blight until I'm oom, then chill for a bit, ED+Blight until I'm oom again. This is NOT a problem on Non shaper/Elder bosses, you will kill them under 2-3 seconds of channel with Blight+ED. When we are mapping we gain so much mana on each kill that it's irrelevant there aswell. This is my current tree, I am sure it could be optimized in some ways but I haven't really gotten around to it, but if you feel you can make improvements or have suggestions, just go for it! Other than that, you are free to choose. Want to run Flame dash? Do so. Want to run a sceptre so you can shield charge faster around the map? No problem, do it. I haven't min-maxed this at all, I just find empty gear slots to throw things into as you can see on my gear. Malevolence or Grace (Run Vaal grace either way) and Discipline (Vaal discipline is also nice, but not needed). Personally I would go with either that you have a watcher's eye for, I don't have any right now, but if i got a Grace jewel I would start running Grace over Malevolence. Solstice Vigil is nice to have, not need to have. Before I used Solstice Vigil I had a random Rare Amulet with around 80 life, 60 res and some str/dex. what a bull good build!
. I have no problem picking up your currently used items currently, but I was wondering how this build would play out being a league starter potentially. Did you use other Uniques/Rares while leveling or getting through map tiers or are the bonus-stats from this unique combination to crucial for the build to function?